Hey, What’s this Weird Tool? Hello everybody and welcome to The Toolbox! 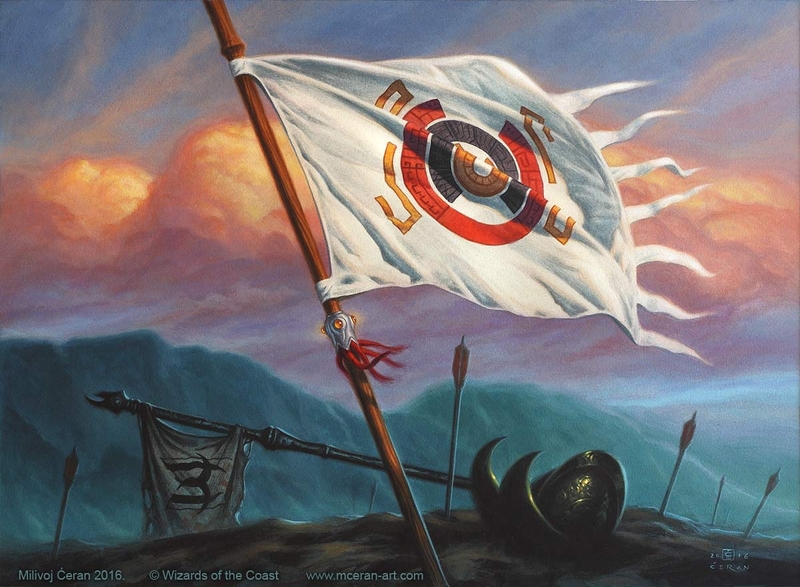 I hope that you are all having a wonderful day and am excited to introduce you to the great Vanquisher’s Banner. In this series, we talk about unique and underplayed cards to add them to your toolbox of commander cards. If you have not read my first two articles on Liquimetal Coating and Grapple with the Past, I would highly recommend it. Not just because I wrote them; really, I would recommend you take a look at every article on the site, because my fellow writers put out some truly great content. But then again, you obviously know that because you’re already reading one of our articles now… but you get the point! We really love to hear what you guys have to say and what you think, so please comment below to show your support! Thanks for reading my little PSA, and no, let’s get right to the article. No, not Bruce Banner. 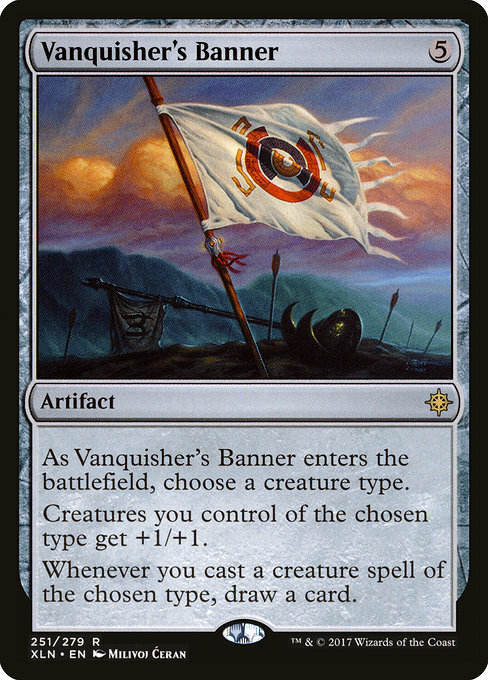 We’re going to be taking a look at the artifact, Vanquisher’s Banner. As it enters the battlefield, we choose a creature type, and creatures with that type get a minor buff of +1/+1. What? Is this just a bad Door of Destinies? No, I have to keep reading? Gotcha. So what else does it do? It draws us a card whenever we cast a creature spell of the chosen type?! THIS CARD IS AMAZING! Please excuse me for just a moment while I place an order with Card Kingdom. My first instinct is to just chuck this card into any tribal deck, but thinking about it more, that would just be wrong. For some decks, the anthem effect is negligible at best or the card draw would come too late in the game, when you’ve already cast a lot of your creatures, making the card inefficient. So let’s take a look at the most popular commanders for this card. To no one’s surprise, we see a lot of tribal commanders, such as Edgar Markov, Gishath, Sun’s Avatar, Krenko, Mob Boss, and Inalla, Archmage Ritualist. I think Edgar and Gishath are very powerful commanders that don’t have oodles of card draw in their colors, so this is a nice little addition, along with the fact that, on average, those decks have a high enough curve/ramp suite to play Vanquisher’s Banner and actually draw cards off of it. The anthem effect is minor with the already colossal Dinosaurs, but with the Vampires, the anthem has a lot heavier weight to it. Krenko is a weird commander to see using Banner. Given the traditionally explosive speed of Krenko decks, I feel like this could be too slow in some cases, but I understand red’s desire for more card advantage. Then there are decks in which I don’t think Banner is worth it, such as Inalla. Wizards are a very odd tribal deck because they, unlike most tribes, don’t particularly care about having lots of ‘lord’ effects to power up their team. Rather than winning through combat damage, there is more nuance and synergy required to get the win. Also, Inalla, Archmage Ritualist’s ability is mainly used to get extra enter-the-battlefield triggers (Banner is a cast trigger, not ETB) and the card draw is obsolete compared to Azami, Lady of Scrolls, which is why I feel that the great Banner is not worth the card slot. So now that we have the parameters of what kind of decks Vanquisher’s Banner should be run in, let’s find some other good places for it! Or, rather, the Hoard, because Dragons love to hoard treasure. 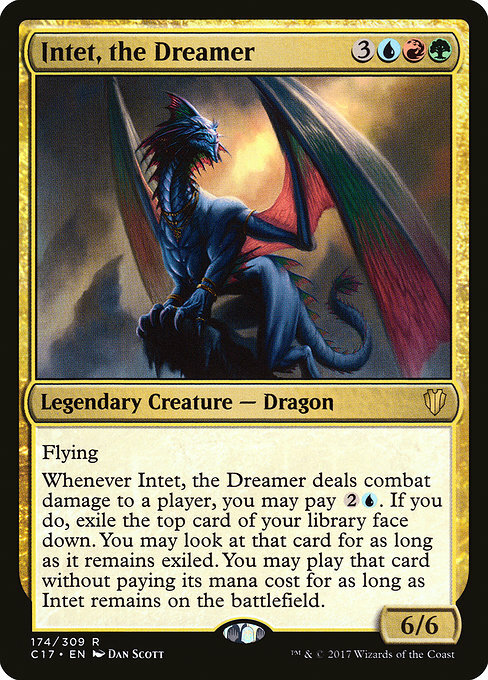 Intet, the Dreamer is a bit of an odd Dragon on his own, so he is the perfect Dragon commander for the series! The downside of Dragons is how expensive they can be, but what if we made them cost nothing? Intet, the Dreamer has this special ability to exile cards from the top of your deck whenever he deals combat damage to a player, then allow you to play those cards for free as long as he’s on the field. That is just insane for a Dragon deck, because they tend to cost on average about five or six mana! For a Dragon deck to be effective, you really have to get your mana accelerated quickly with things like Kodama’s Reach or Skyshroud Claim. For those that play ramp decks, sometimes you just run out of cards and have nothing to do. However, if you have Vanquisher’s Banner out, you can draw a card just by casting your commander. Then you play more Dragons either by hardcasting or Intet-casting them, so you draw more cards, and you keep doing that until you win! There is not a lot of point to mentioning the cards Banner synergizes with, because really any Dragon fits that description and you can see those in the decklist! Well I guess I don’t know for certain that you are, but I do know Derevi, Empyrial Tactician is! 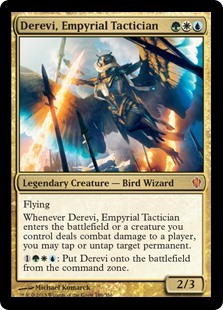 Derevi is a 2/3 flier for three mana, which isn’t great, but she has a quirky ability that lets you tap or untap permanents whenever Derevi enters the field or whenever any creature you control deals combat damage to a player. Triggering on each creature that hits? Yeah, it’s a smidge broken. You can also just put Derevi straight onto the battlefield from the command zone for four mana, which is totally fair. Nothing broken about skipping out on commander tax. Wizard tribal is very interesting with Derevi at the helm. This is a much more aggressive deck compared to its more combo-oriented counterpart, Inalla. So why should we run Vanquisher’s Banner with such a low-to-the-ground deck? Well the answer is quite simple, untapping lands and generating a load of mana makes the five mana for Banner an insignificant cost, and it’s all upside from there. Play creatures, creatures untap mana whenever they hit people, play more creatures, draw more cards. The anthem effect is gold in this deck, the card draw shores up a major weakness as well, it’s just too good! Seriously, how good must it feel to immediately rebuild after a Wrath or to keep building a board presence while always having cards in hand? I cannot wait to see all the neat interactions in this deck, so here it is! He may not be the banned giant spaghetti monster, but Ulamog, the Ceaseless Hunger is one bad Eldrazi. Even on cast – meaning he doesn’t have to resolve to get this effect – you just straight up exile any two target permanents! I play Scour from Existence in some decks, so it is nothing but straight upside from there. Once it resolves, you get an indestructible 10/10 with even more text, because of course, it needs more text. Whenever it attacks – once again, you do not even have to deal damage – the defending player exiles the top twenty cards of their deck! This card is amazing but why does a big bad Eldrazi need a puny banner? If you thought white’s card draw was bad, just look at colorless card draw. Aside from Kozilek, the Great Distortion and Staff of Nin effects, pretty much every way to draw cards is a mana rock that you have to sacrifice to actually draw cards. Using Mind Stone or Hedron Archive as the main way to draw cards in a deck just seems bad, which is why, in an Eldrazi tribal deck, Vanquisher’s Banner is exactly what you need. The anthem effect is negligible considering the already massive bodies that Eldrazi have, but the card draw is an absolute necessity that is all too often ignored. Let the great Eldrazi reign! Oh, Angels. They’re such a powerful but sometimes inefficient tribe. My Angel general of choice is Gisela, Blade of Goldnight, because that damage-doubling-damage-halving effect is just too good. Really, any Angel deck should run the Banner, not just because they’ll need the card advantage, but also because they’re combative enough to also make good use of the anthem effect too. 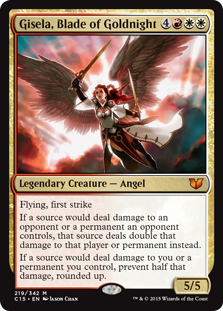 You have some great Angels like Aurelia, the Warleader, but the mana cost of all the really strong Angels is so high that you need a strong ramp package. This means that when we cast our Banner, we won’t have already run out of Angels in our hand to trigger it on future turns. From there, we amass a big board state and easily swing for the win. Playing an anthem that draws us cards is perfect in this deck. There’s not much to say past that, so here are some Angels! Angels and Demons? Is this a Tom Hanks movie? 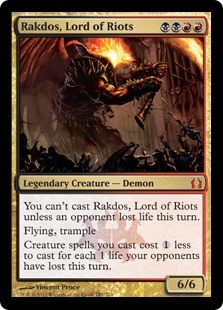 Anyway, Rakdos, Lord of Riots has to be my favorite Demon commander. A beefy 6/6 flier for four mana that decreases the cost of our spells when our opponents lose life is just incredible. The downside of not being able to cast him unless an opponent has lost life is negligible with cards like Cryptolith Fragment in the 99. This is exactly what I want from a commander. Black does shore up the weakness of card draw a little bit with things like Sign in Blood, but just imagine the feeling of bashing someone with Rakdos, making all your Demons six mana cheaper, and then just keep chaining them with Vanquisher’s Banner to fill the board! There is just no downside to running this card along the likes of Razaketh, the Foulblooded and Abhorrent Overlord! I need to do some brewing, so here’s the decklist. Thank you all so much for reading and showing your support for us writers! I hope that you have enjoyed reading about Vanquisher’s Banner just as how much I have writing about it. I would love to hear any suggestions you have for the series, so please comment below. Thank you all once again, and have an amazing rest of your day!